A wiki is a web site anyone can edit. It differs from a blog in that a blog is only edited by the person who owns it, whereas a wiki can be edited by anyone who has access to it and knows the password (if it is a password protected wiki). With the exception of a few easy to learn formatting codes, a wiki does not require you to learn a lot of fancy coding such as HTML. 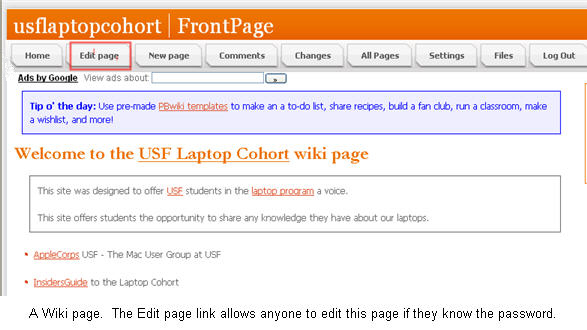 Since it is so easy to create and modify content, a wiki encourages participation and collaboration. One of the best examples of a wiki is the online encyclopedia Wikipedia. There are several free sites, such as pbWiki, that will host a wiki for you. There are many ways you can use wikis in your classroom. Wikis are often used for group writing projects. They can also be used to create repositories of resources for group projects, such as an annotated list of websites that can be used by the class as they work on a research project.